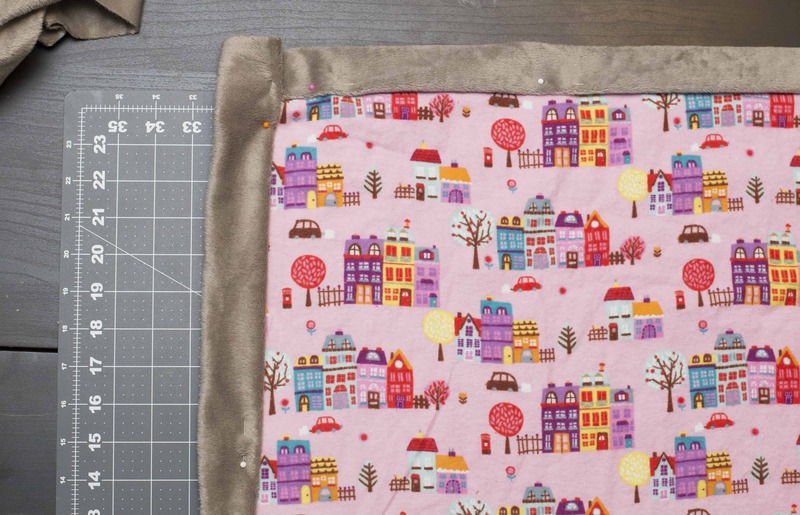 Looking for a baby blanket sewing pattern? This simple tutorial (and must-have new baby checklist) is perfect for any new mom or those of us looking to give the perfect gift! 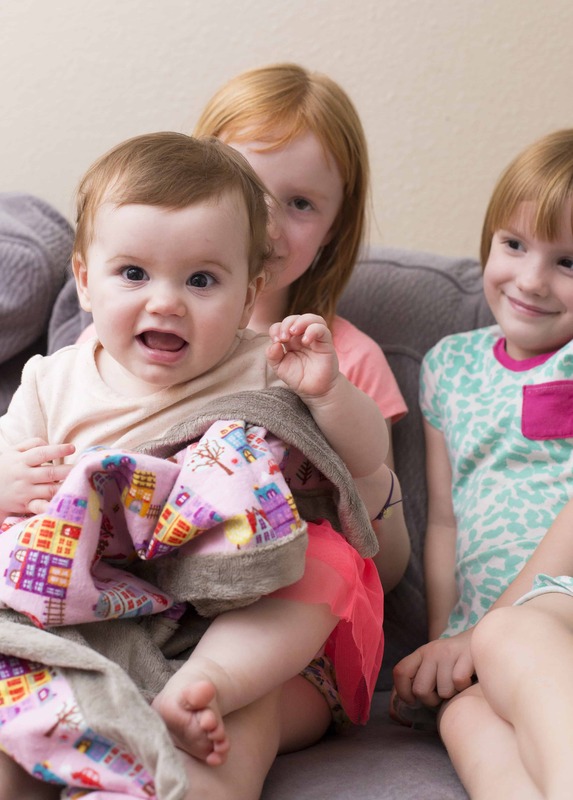 Read on for the full DIY sewing tutorial including the best fabric for a baby blanket (hint: minky is one of them!). It seems like every mom-blogger has created an “essentials for baby” list and most of them are SO different! The thing is, nothing but experience can tell any new mom what products and gadgets will be the most helpful as their baby grows. Keeping 7 babies alive (so far, so good!) has taught me that there are really only a few true necessities for a newborn. You ready for them? *stuff for handling the poop. Last week I ran to Target (because…TARGET) to grab some gift basket stuff for my little sister’s brand new baby (isn’t Crosby so cute?? MY OVARIES!) and I just kept it to the basics this time. She had all the big stuff already from her first son and besides, she’s a minimalist. Click read more below for all the deets on each necessity and what I love about them! Feeding stuff: if you’re breastfeeding, you won’t need much. I recommend a good breast pump (helpful even if you won’t be working away from home), a nursing cover (if desired) and a decent set of bottles for when you need to leave baby. Some breastfeeding moms choose not to use bottles but I personally always need a break from this demanding mom-job!Getting my babies to take bottles of breastmilk at just a few months old has been a lifesaver for me. If bottle feeding, you’ll definitely need good bottles and lots of them. I love these Playtex VentAire Wide Bottles (pictured) for several reasons: The width makes it easy to mix formula or pour in precious breastmilk (when it takes a half hour to pump, spilling is not an option!) and they’re easy for babies to hold. Mimi has been picky about her bottles (since we’re in the process of weaning right now) and she has no problem with these. The bottom has this little anti-colic vent that actually keeps the bubbles at the bottom so baby doesn’t get gassy. Also, I’m a huge fan of the angled neck design…it makes it super easy for me to feed her while she’s partially sitting up, and for her to feed herself! Mimi uses the 9 oz. bottles but I also bought a package of the 6 oz. ones for my sweet nephew. Stuff for handling poop: Diapers are a given, amiright? No matter how many kids a mama already has, she still needs diapers. And after the diapers are pooped in, you’re gonna need someplace to put them. 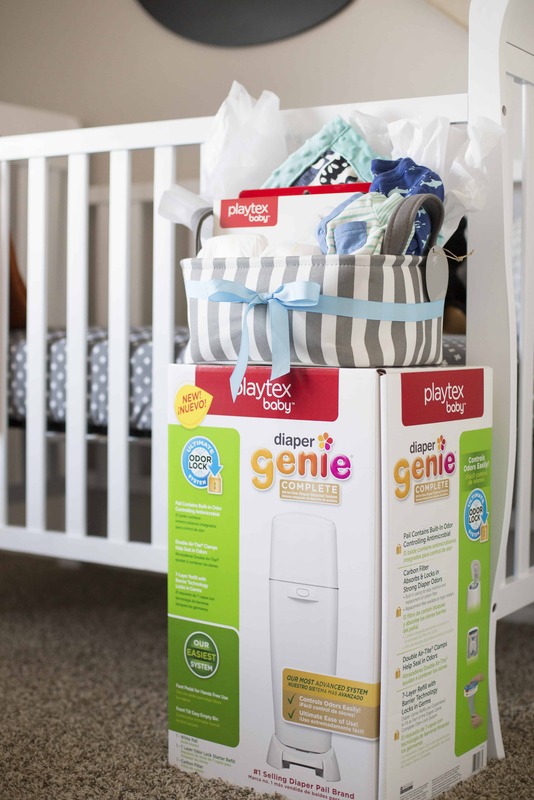 I’m always nervous that my house smells like poop when people come over, which (especially when I had 4 kids in diapers at night) is a legitimate concern, so I also bought a Diaper Genie Complete.At the risk of sounding like my grandma, let me just say…they don’t make diaper pails like they did when my first kid was born! This Diaper Genie is the best: it not only has a 7-layer bag to lock in the stink, but it has a carbon filter in it. I also bought and made a couple cute outfits for the wee one. I’m loving this super cute one piece (also from Target). Now for the blanket! If you’re anything like me, you’ve found yourself waking up some Saturday morning and realizing that you have a baby shower to go to…and no gift! I whipped up a blanket like this on one such morning and have since made about 5 others. I’m obsessed! And, if you have all your supplies out and ready, they literally take 12 minutes to make (I timed it!) You ready? Let’s do it! 1.25 yard Minky or other super soft fabric (60″ wide) – Since this stuff can be expensive, I like to buy mine online or use a coupon in store! 1 yard patterned coordinating fleece (42″ wide) – all the cute patterned fleece pictured here is from Joann Fabrics. 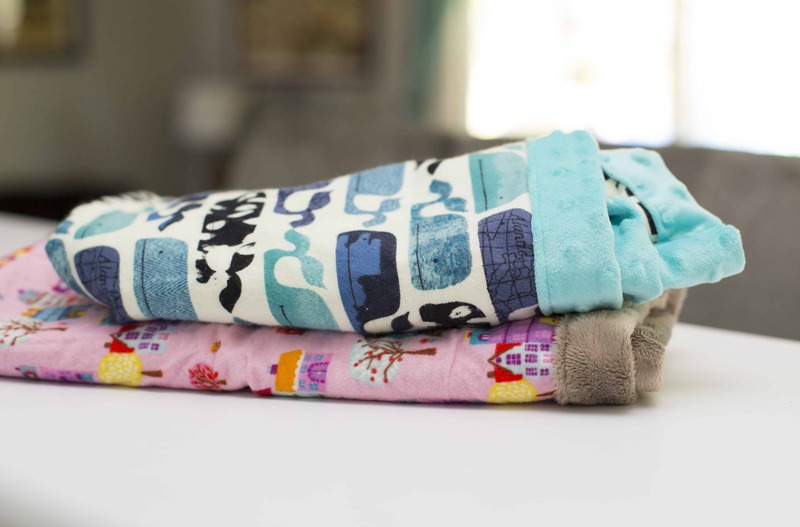 Ok, so there are 2 sizes that I like to make of these blankets: one is a really big 40″ square which is great for swaddling an infant, for covering a car seat, using as a nursing cover or for a play area on the ground. 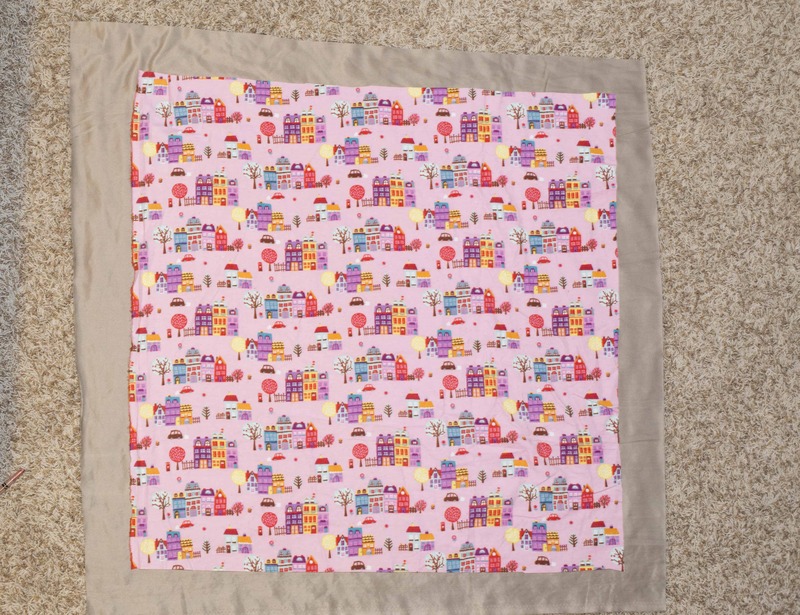 The other size is about a 25″ square which is perfect for a little lovey blanket to cuddle in a crib or for a toddler to drag around. I love them both! 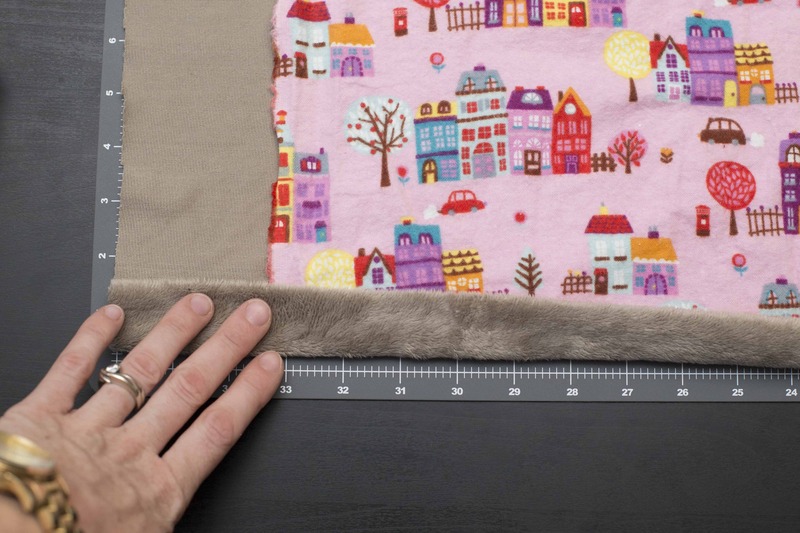 The fabric amounts above will make the big 40″ size. 1. First determine what size you want. 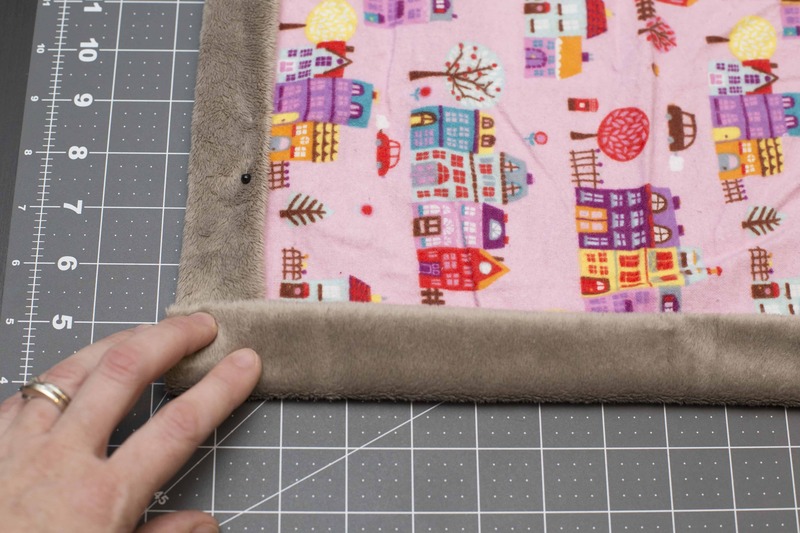 An easy way to cut the super-wide 60″ minky is to fold it across itself diagonally and just cut at the raw edge. This will give you a 60″ square. 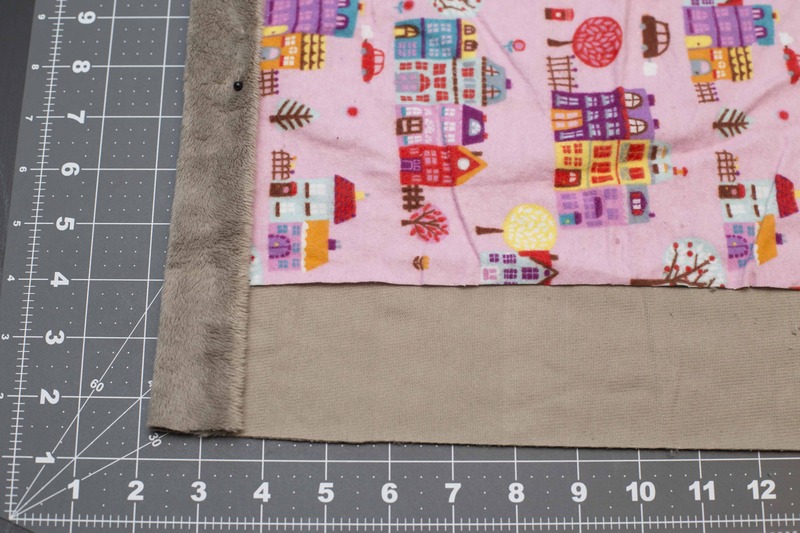 I then cut it down a bit to about a 46″ square (you will want an extra 5-6″ than your finished blanket size). 2. Cut down your coordinating fleece until it’s the size you want your finished blanket to be (i.e. 40″ here). Lay it face up on the WRONG side of your minky (wrong sides together). 3. Now begin folding up the minky/fuzzy fabric on one side until the raw edge is even with the raw edge of the fleece. 4. Fold up again so that both raw edges are hidden inside the minky. Pin in place. 6. Keep that first side folded neatly while you begin folding up the second side. Be sure to pin securely on that folded corner! 7. 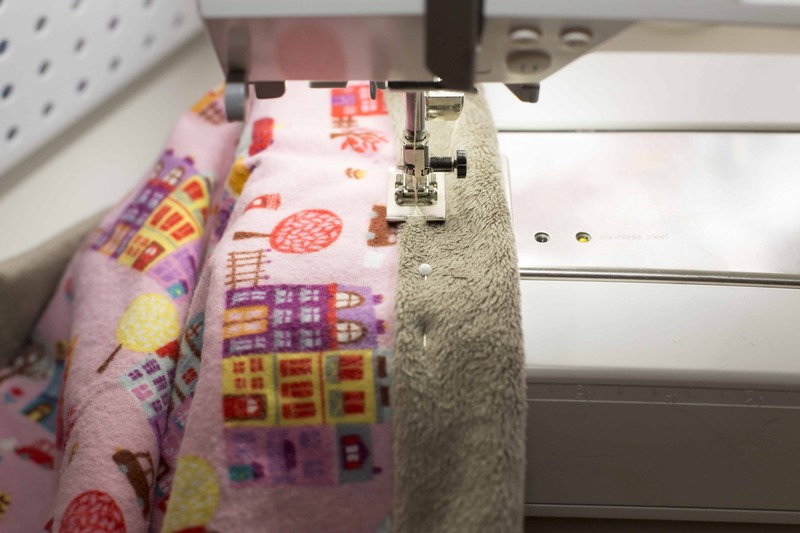 Once you’ve folded and pinned all the way around, begin sewing your blanket pieces together right at the inside folded edge of your minky. When you get to the folded edge, be sure you stitch all the way to the end, then leave your needle in the fabric, raise your pressure foot, pivot 180 degrees and stitch back up to the inside folded edge. Then pivot again and continue sewing where you left off! This will make sure your folded edge is nice and secure. 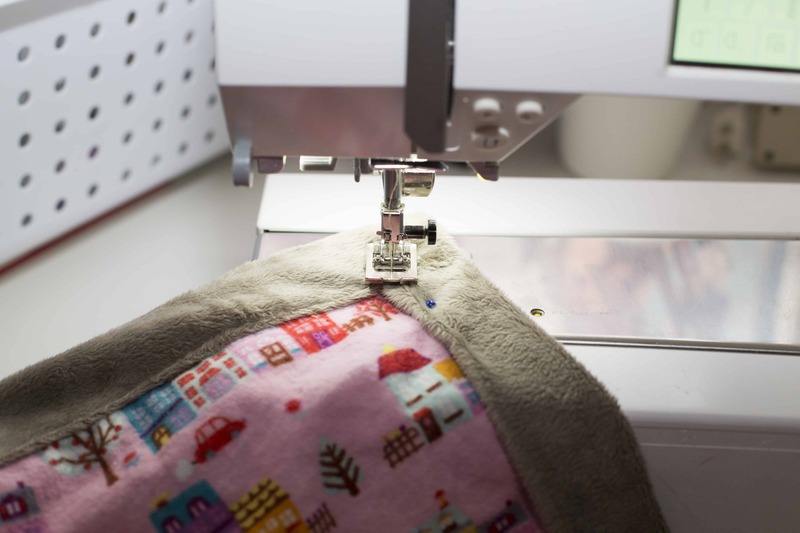 NOTE: One word of advice when working with minky or other fuzzy, cozy fabrics, they tend to stretch and cause puckers under your presser foot. 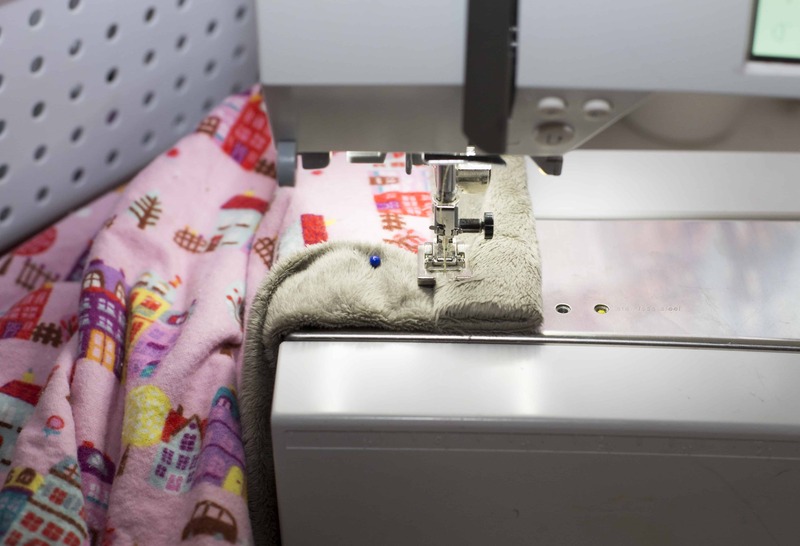 To avoid this, I lower the pressure on my pressure foot dial so that it doesn’t pull the fabric too hard and I can feed the fabric through fairly evenly. And even if some puckers form, the fabric is so thick, they’re not even very noticeable. Don’t forget to backstitch at the beginning and end and VOILA! You’re done! Wasn’t that super easy?? And the more of these you’ll make, the faster you’ll get! Now you have a perfectly cozy, darling little blankie ready for the next new baby (or big baby) that needs one. I’m thinking I might even make myself a queen-sized one. Ha! Looking for another, slightly more difficult, blanket tutorial? Check out this cute faux-quilt! What else would you put in a bare basics baby gift? Something other than just bottles and poop management? Are there any other quick baby gift tutorials I should know about? Thanks so much Cristi – I hope you try it! Love those cute blankets! I’ll have to make a trip to JoAnn’s and see if my store has that adorable whale fabric. Thanks Ali!! Isn’t that the cutest? Stop with all the cute baby pictures already!! I can’t take it, not if I’m going to remain strong and stop at 4 kids!! Your nephew and Mimi are complete adorable! And I love everything you sew, but blankets are one of my favorite things.